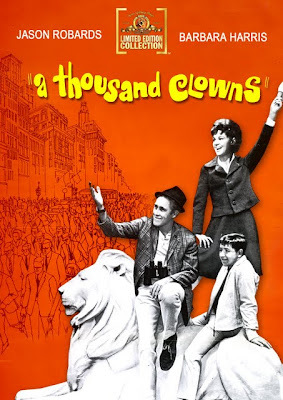 Even though he managed to craft an Oscar nominated Best Picture contender right out of the gate, the 1965 release of A Thousand Clowns marked the first and only feature motion picture helmed by Broadway director Fred Coe. Dubbed “the patron saint of writers,” Coe was perhaps most famous for his taste -- discovering, launching and/or skyrocketing the careers of some of the most notable playwrights in twentieth century American theater including Horton Foote , Paddy Chayefsky and Herb Gardner . In an extraordinary feat that actor Jason Robards considered nothing short of “a miracle,” Gardner penned Clowns ’s humorous but heartfelt tale of midlife nonconformity when he was in his early twenties, drawing inspiration for the character that Robards originated onstage in ‘62 on his friend Jean Shepherd (who later turned his own life into A Christmas Story ). To post-Beat Generation , pre-hippie eccentric iconoclast Murray Burns (Jason Robards), there’s nothing more horrible than the sight of men and women– smartly dressed in business appropriate skirts and gray flannel suits – going to work, pounding the pavement of the concrete jungle from nine to five in New York City. Having taken advantage of unemployment insurance benefits for five months since walking away from his day job writing jokes for a children’s TV show, Murray is forced to confront his fears and face responsibility as a guardian when his slacker existence catches up to him in the form of social workers looking to take away his best friend, roommate and precocious twelve-year old nephew, Nick (Barry Gordon). Admittedly at times -- and similar to some of the collected plays of Neil Simon -- Gardner’s highly verbal characters can be guilty of sounding a bit too much alike. And in this case, the intelligence of the youngest character can be as much of a refreshing blessing as it is an annoying curse since even kids who go to the “genius school for big brains” should still occasionally speak like twelve-year olds. However, when the banter is this good, we can’t help but look past the delivery in Coe’s film that boasts a song written by a “big brain” actress with an IQ of 172 who's famous for playing dumb as Judy Holliday provided the lyrics for the titular theme song in her last career credit before succumbing to cancer. With the exception of Sandy Dennis who passed on the picture despite winning a Tony for her part – paving the way for newcomer Barbara Harris to make her Golden Globe nominated film debut – most of the original Broadway cast revisited their roles as Gene Saks and William Daniels reunited with Robards and Gordon along with the behind-the-scenes team of screenwriter Gardner and filmmaker Coe. Although Ralph Rosenblum would go on to do great things influencing a generation of cutting-edge cutters in his ‘60s and ‘70s collaboration with Woody Allen -- brilliantly editing the Woodman’s postmodern Best Picture winning romantic comedy Annie Hall along with upping the artistry of Bananas , Sleepers , Love and Death and Interiors -- his work on Clowns is far too self-consciously cinematic. Attempting to break up the at times overly stagey production feel of the dialogue-driven script by literally reminding us that instead of being a play recorded on film, A Thousand Clowns is a movie, damn it (! ), Rosenblum uses every tool at his disposal to grab our attention to chaotic effect. Channeling the techniques of the French New Wave with no rhyme or reason except perhaps out of sheer boredom from being given one main bedroom location to look at, Rosenblum pulls us from one place to the next with choppy jump-cuts , clunky sound-bridges and chaotic transitions. A timeless portrait of a man who doesn’t want to be one of a thousand clowns despite knowing deep down that we’re all in this human race together -- regardless of the film’s shortcomings as a cross between an editing experiment and a static play, we remain utterly charmed from start to finish, amazed it was conceived by someone so wise (and so young).